Bernie Swain is the founder and chairman of Washington Speakers Bureau and the author of the book What Made Me Who I Am. In this article for Harvard Business Review, he shares some of they key discoveries he’s made over the years talking to eminent leaders that have changed the world – what were the turning points in their lives, the defining moments and influences from which they draw motivation and inspiration. For Madeleine Albright, the former U.S. secretary of state, it was her father, a serious man with far-ranging intellect whose career as a Czechoslovak diplomat was short-circuited twice: by the German occupation in World War II and by the Communist takeover after the war. After the family moved to the U.S., he became a professor living in cramped faculty housing — quite a step down from an ambassador’s residence — but worked at his job cheerfully and diligently. A recent report by The Council of Economic Advisers shows that 83 percent of men in the prime working ages of 25-54 who were not in the labor force had not worked in the previous year, signalling the disappearance of 10 million men from the workforce. Comparatively, in the 1960s, nearly 100 percent of men between the ages of 25 and 54 worked. What’s driving this trend? Economists seem to believe that it’s technology and overseas competition, that have been displacing many jobs over the last years. Is the era of full-time work over? It seems that nearly 90 per cent of the jobs created in Australia over the last 12 months were part-time or casual. But we know for a fact that this phenomenon extends beyond Australia, into a global trend that has made flexible working the new norm across the Globe. If we look back 10 years ago, probably 90 per cent of the workforce was in a permanent kind of job arrangement. I think you’re going to see that drop down to half of the workforce or less in the next few years. Joining Cornerstone as Principal Consultant, Talent Acquisition on their Global Thought Leadership and Advisory Services team, Sarah Brennan, talks about the impact of analytics on talent acquisition, and how companies can find (and keep) the right talent. 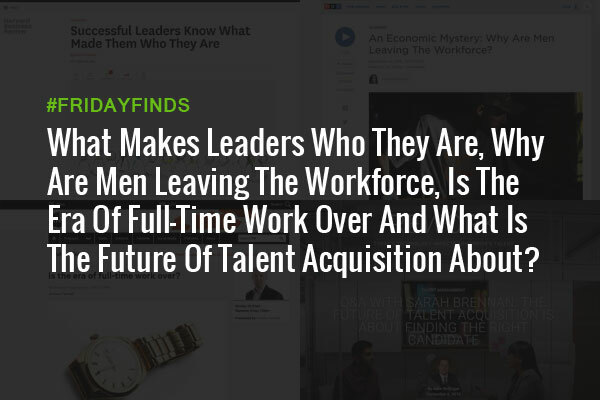 We’ve really just seen a shift in talent analytics within the last couple of years on a widespread level. The analytics that were available 10 or even just five years ago didn’t truly provide direction for business decision-making, driving results or actually making any type of strategic change. Today, the technology has advanced to a point where we can start looking at the impact—not only of new hires, but on every movement a person makes throughout their career within an organization.